Readers often ask me where I got the stainless steel beading cups that I use to hold each of the bead types I’m using for a particular project. Since these are my go-to tool for keeping my seed beads and other materials separate and accessible while I work, there’s always at least one or two on my bead tray each week. The trouble is, I can’t say for sure where to get the exact cups that I use, since I repurposed them from a mug set that was gifted to me years ago. I recently went on a hunt for similar coasters that would be perfect for beading. It’s surprisingly difficult to find coasters of just the right design. 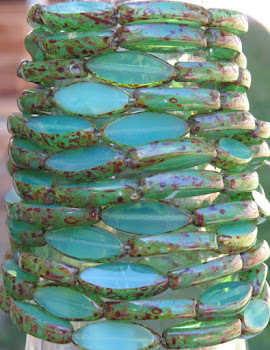 Most are simply flat slabs of one material or another, and don’t have a rim that will keep beads in. Others have an enormous rim, which defeats the purpose – the reason these coasters work so well for beading is that they don’t get in the way of needling up seed beads one-handed. 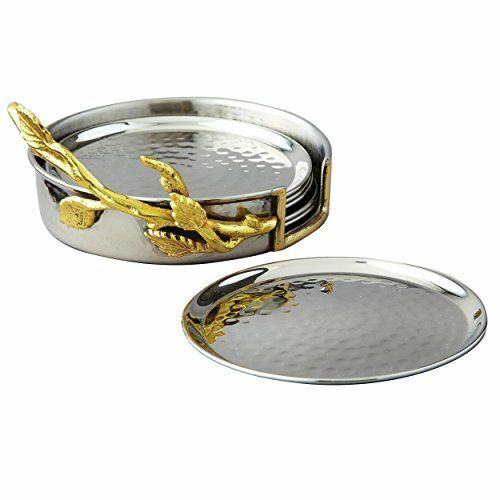 These Elegance stainless steel coasters are by far the best of the bunch. Although I don’t like to use metal materials in my work, I do like it for my tools because they’re better for the environment than plastic overall, and very sanitary. 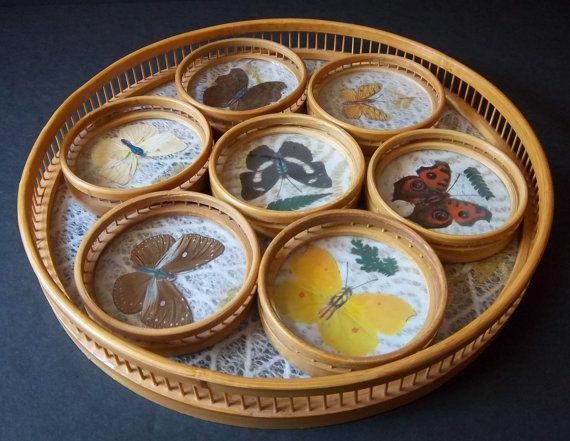 These coasters could be soaked in warm soapy water if needed, and will be dry and ready to use again in seconds. They’ve got a smallish rim for keeping beads in place, and no extra decorations to take up space. The only downside is the holder. Unless you go long periods without doing any beadwork, or clean up completely between every single project, it’s not likely to get much use. This InterDesign Rain Coasters set has all of the size and shape features that I like, but sadly isn’t made from glass as I thought when I first spotted them. To be fair, the plastic coasters would be very lightweight, making them nice for taking a project on holiday. Plus, they're just as washable as a stainless set. 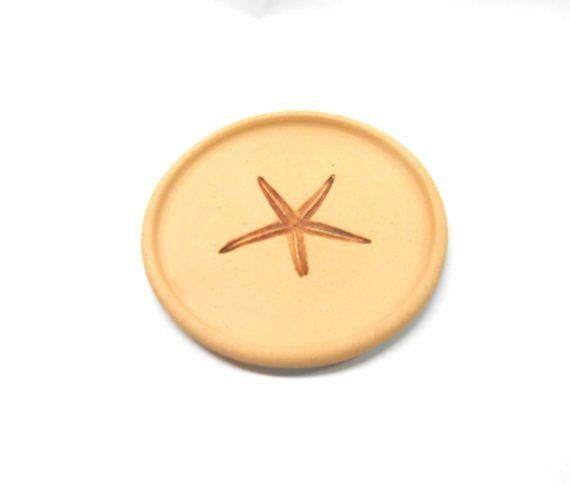 This handmade ceramic coaster from Pottery by Saleek is gorgeous, and has a nice ridge, with some inspiring decoration. 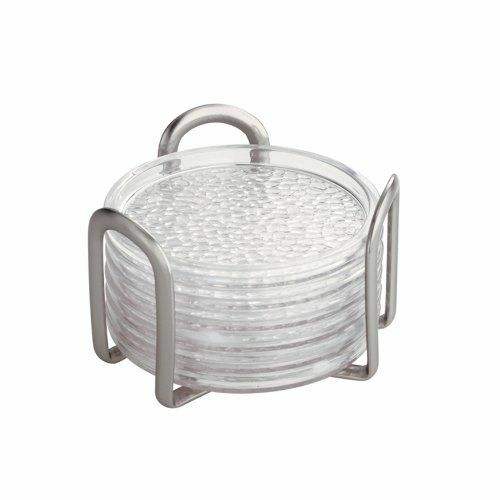 The only downside is the size – it’s meant for wine bottles and takes up a whopping 5 ½ inches. 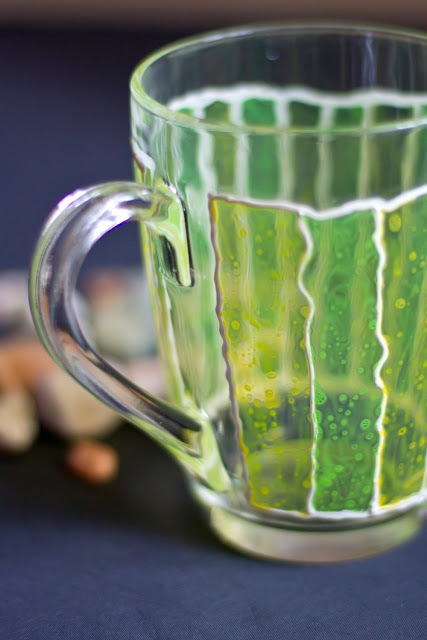 This one would be great for bead soups or anytime you only have a single material to work with. 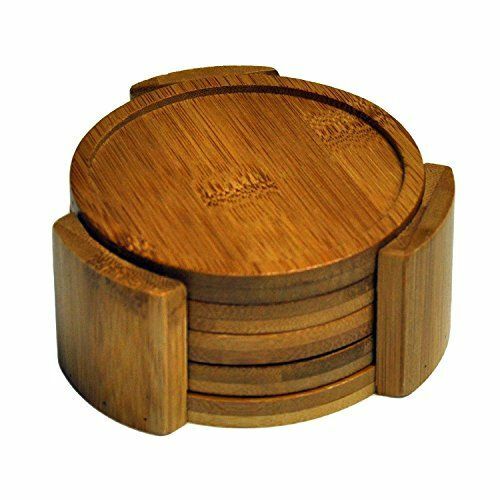 These bamboo coasters by HealthPro are very pretty and have all of the right features, minus the unnecessary holder. They should be fairly lightweight, which is always a bonus. The only real downside would be that they’d have to air dry after washing. If you’re a disorganized or procrastinating beader like me, you might struggle with timing clean ups for periods when you won’t be needing them. 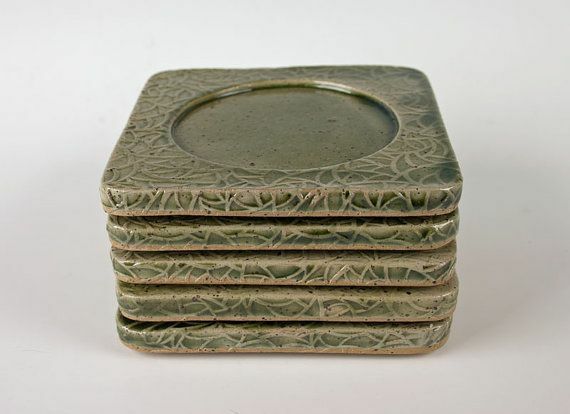 Another handmade ceramic set, these coasters by Laura Harmon Pottery are really lovely to look at. The decorative edge would take up a lot of workspace, so these probably wouldn’t do for a bead tray like the one that I use, but they’d be great for an open workspace. Washability is definitely a bonus, and they wouldn't be prone to shifting around your workspace or spilling unexpectedly. Although the rims are much too high for beadwork, I couldn’t resist including this vintage coaster set from DayJahView. The design is gorgeous, and the holder could double as a tray for tools, finished projects, or just about anything in your workspace that needs a transportable home. While not ideal for seed beads, these coasters would work really well for larger beads and other materials that don’t require a needle to pick up. I also found some great DIY projects for making your own coasters. 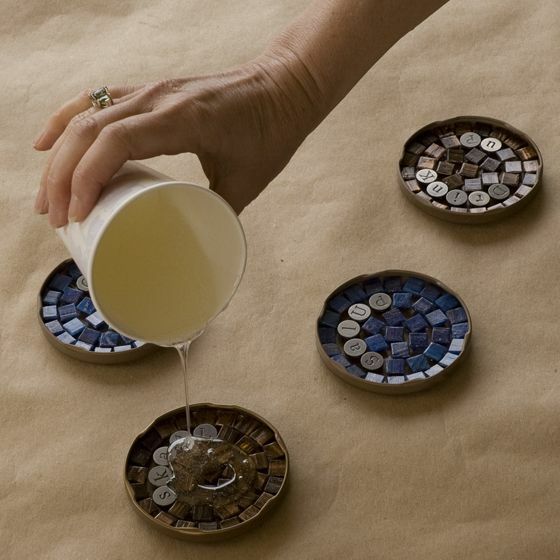 The most functional one is this tutorial for mosaic coasters made from old jar lids on Running with Sisters. If you’ve already experimented with resin pouring, it should be a snap. 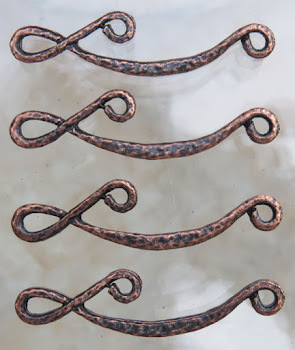 You could easily create coasters with the rim height that you want, and include an inspiring design. I highly recommend checking out the thrift shops in your area and scouring the housewares for coasters that would work in your beading space. Even if you can’t get a matched set, these bead holders are a wonderful addition to your tools, especially if work with plenty of tiny seed beads. You can also keep an eye out for mug and coaster sets with the right features. Use the mugs for coffee or to hold your other tools and pencils! Do you have any repurposed tools in your workspace? One of the best things about most flat beadwork stitches is their ability to transform with just a few simple tweaks. Start with a ring, and you get a gorgeous rope. Drop or add a bead in the right place, and you’ve got some intriguing shapes and structures crafted with beads. This variation on diagonal peyote stitch uses two-hole SuperDuo beads for a honey-comb like pattern that is perfect for earrings and pendants. The technique is pretty simple, and the large bead sizes make it easy to stitch. Even if you’re not quite comfortable with ordinary flat peyote stitch, this technique is very easy to start thanks to the SuperDuos. 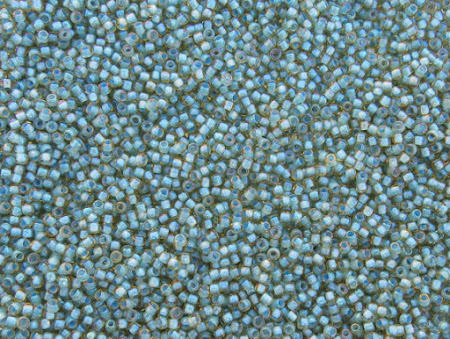 To make a swatch of diagonal two-hole peyote, you’ll need a few grams of 11/o and 8/o seed beads, and some two-hole beads that are a good match for 8/o’s. SuperDuos are ideal, but you could also try this with Rullas, half-Tilas, Twins, Bi-Bos, or smaller CzechMates. In this tutorial, we’ll be using two colors of SuperDuos for clarity, but you can certainly create any pattern or palette that you like. 1. Attach a stop bead to a comfortable length of beading thread, leaving a 6 inch tail. Pick up 1 color A SuperDuo and one 8/o seed bead. Repeat 5 times, then add a 6th SuperDuo. 2. Flip the beadwork so the stop bead is facing away from you. Pick up three 11/o seed beads and a Color B SuperDuo. Stitch up through the 2nd hole of the last Color A SuperDuo added in step 1. Pull snug. 3. Pick up 1 Color B SuperDuo, and stitch through the 2nd hole of the next Color A in the strand. Pull snug and repeat along the row to add a total of 6 Color B. 4. Flip the beadwork. Pick up three 11/o seed beads, and stitch up through the 2nd hole of the last Color B added. 5. Pick up 1 Color A SuperDuo, and stitch through the 2nd hole of the next Color B in the previous row. Repeat to add a total of 5 Color A. 6. Flip the beadwork. Pick up 1 Color A SuperDuo, three 11/o, and 1 Color B. Push the Color A SuperDuo up to the work, then stitch up through the 2nd hole of the same Color A. Carefully pull snug. 7. Pick up 1 Color B, and stitch up through the 2nd hole of the next Color A in the previous row. Repeat to add 4 more Color B, for a total of 6 in this row. 8. Repeat steps 4-7 until your swatch has reached the desired length. 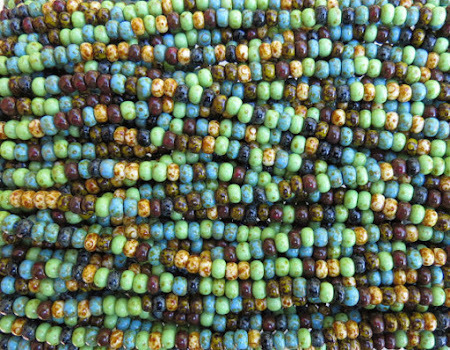 Finish with a Color B row, and turn to add three 11/o seed beads as usual. Fill in the final row with five 8/o seed beads. Add a loop or finish as desired, then weave in your thread and trim. Are you a fan of SuperDuos? What’s your favorite stitch to use them with? Another giveaway has come to a close, and this one might be our best ever! This month we had two stunning prize packs designed by Beads and Babble, including a huge assortment of beads and tools valued at over $150. That’s a lot of inspiration! Our winners are Maya and Holli – congratulations to you, and thank you so much to everyone who entered! I asked you to tell us what your favorite picks are from Beads and Babble, and with such an amazing selection, your answers were incredibly varied. The winning comments picked some very delectable Czech glass and lovely copper components. A huge thank you goes out to Beads and Babble for sponsoring this giveaway just in time for holiday crafting. Have you started your gifting projects yet? What are you making this year? The first design in my new challenge series was a quick project that I couldn’t wait to start. 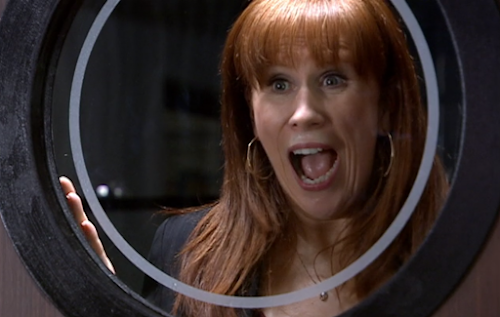 When I decided to start a new series inspired by my favorite nerdy themes, the very first inspiration that came to mind was my favorite Doctor Who companion, Donna Noble. 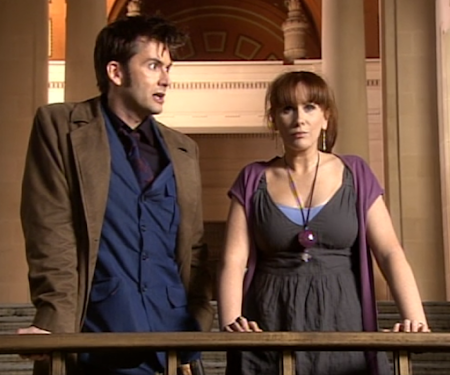 Donna was one of the toughest and funniest of all the ladies to travel with the Doctor. She was my favorite right from the start, and continued to be awesome right until the sad, irreversible end. Donna was incredibly stylish, and often rocked lovely gray and purple ensembles to compliment her ginger locks. It was this palette that I wanted to use for my inspiration, which would prove to be the biggest challenge. An overall design was easy to envision – most of her best outfits included a big pendant or opera length necklace. I started by pulling out every single gray and purple bead that I had in my stash, just to see what my options were. While I was sorting, I spotted a recycled bottle glass pendant that I thought might come in handy. Sure enough, it was a perfect fit to outline a pretty gray shell butterfly. All I needed to do was add some chain. I stitched up a quick St. Petersburge chain with white-lined black and purple-lined Rosaline, then suspended the bottle pendant from the chain, and the butterfly from the pendant. The double loop on the butterfly helps to keep the chains in place, and everything looks as sharp as the best temp in Chiswick. So the first design in the new series is complete, and I’m pretty happy with the result. I have lots of other character inspired designs in mind, and I’m working on a list of some even more obvious inspirations that my fellow geeks should enjoy. Are you a Whovian? Who’s your favorite companion? This week I got started on my new abstract/ugly necklace design, using nothing but culled seed beads. I’ve always got an old tealight cup on my bead tray to collect beads that are a little wonky, and after so many years of beading, I’ve collected a lot of them. They’re the perfect material for an ugly necklace, and my plan is to stitch a great big swatch of them with right angle weave. This will be the base for my piece, which will probably include some embellishments of assorted bead leftovers and some Unfinished Objects. I’ve still got a tray of lime green 8/os waiting to be put away after shooting some photos for an upcoming tutorial. I’ve got 3 different projects lined up for you in the coming weeks. The one I’ve just completed is so much fun – I think you’re going to really love it. Keep watching for that one! Working with glass is one of the best things about beading. The versatility of shape, color, and transparency allows us to create with some of the most beautiful materials available – from tiny seed beads to gorgeous cabochons. To showcase the beauty of glass and all that it can do, I invited glass painting artist Lyuba of zmeyssHandMade to share some of her favorite inspirations. 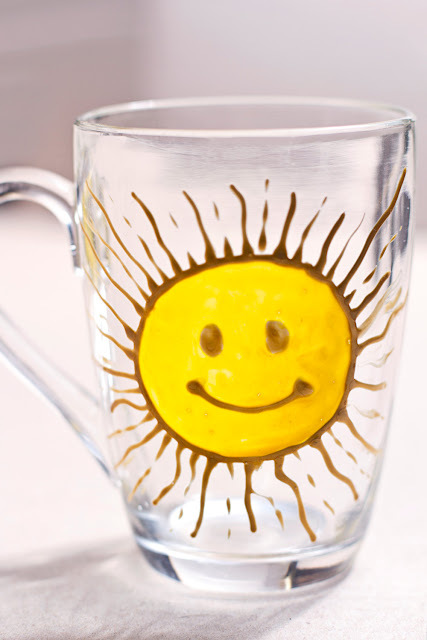 Her Etsy shop, based in Ukraine, is filled with pretty hand painted glasswares that are a delight to see. Inspirational Beading: When did you first get started with glass painting? Lyuba: It was approximately 5 years ago. I quit from full day job and have time to create something new. In art store I saw stained-glass paints. 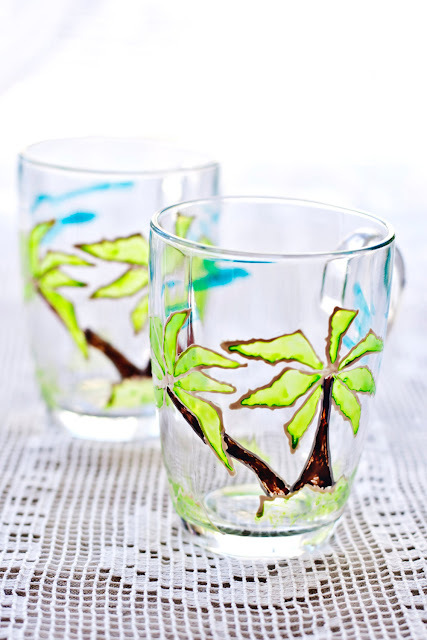 Example of painting was wonderful, so nothing can't stop me, even thing that I can't draw ;) At home I took glass and make special holder for brushes. Inspirational Beading: What is your favorite thing about your art? Lyuba: I really like my cats set. This two pieces are parts of one whole. 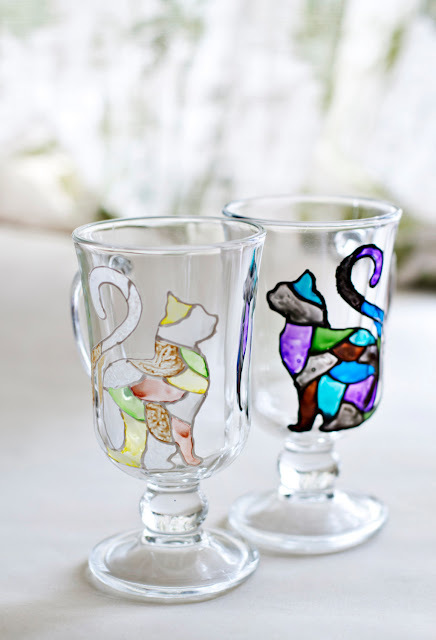 Black and white cats was creating for couple that like spend time together, like hot mulled wine and enjoying life. For creating this set I was inspiring with "Black cat, white cat" Kusturicas film. It was so strange and wonderful... Different world and traditions make me laugh. Lyuba: Yes, I have this glass till now as a brushes holder. I took faceted glass and draw different line in which facet. There is multicolor stripes, dots and another geometrical patterns. It was transparent paints, but they afraid water. My nephews wanted draw too... first paints was end very quickly. Lyuba: Inspiration is around us. In small human-made things, in streets and squares. I live in Kyiv, it's a big city. We have many different beautiful things around. Old streets, river Dnipro, parks and churches. But some time I take inspiration from humans around. With my painting I want bring some positive mood into life. We should be happy and can reach this with small simple things. This cup was first sold in my etsy store. Lady bought it for moms birthday. Lyuba: It's not cup, but have stained-glass view too. I love create butterfly decor from free bottles. They always one of a kind even I want repeat. Unique design and bright colors perfect for nursery or another place. They united transparent parts and opaque. Compared true stained-glass my butterflies can't be broken after get a spill and have low weight. They can fasten by sucker or two sizes tape. 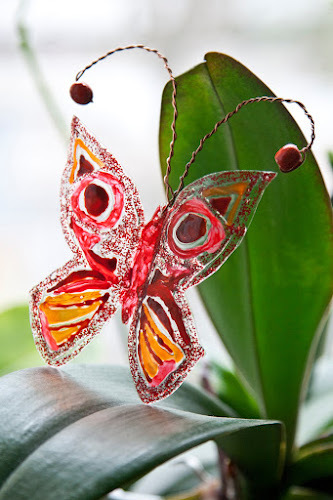 The butterflies get flying with every gust of wind when use in nursery mobile or as free flying decor. Lyuba: Of course. My favorite colors are green and yellow. There is colors of spring, time when all world wake up after winter and get start new life. The Earth go at new circle and sun warm up all around. 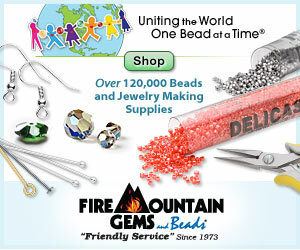 Inspirational Beading: Do you have any other favorite materials? Lyuba: Sure! I like work with wire, acrylic paints, paraffin, beads, natural fibers and alabaster. More exiting unify all this things in one creation! Sometimes it looks strange. First my creations by hands was letter tags from alabaster. I have two days before New Year night, two nephews that can't read and ten presents for them. Alabaster and acrylic paints save me, children was happy. Next year same tags was create from wire and beads, after from wire and yarn. I believe, anyone can do anything... if want it. Lyuba: This is cup with multicolor houses and nursery mobile with glowing in the dark butterflies. City cup fresh and bright. Specially for European architecture lovers. 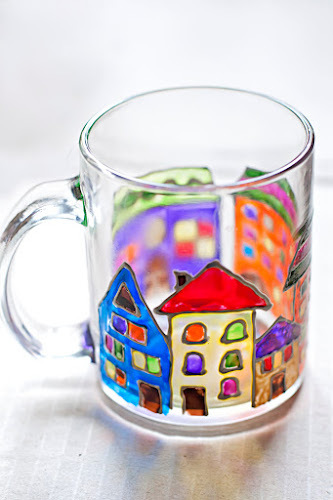 Small colorful houses, multicolor windows inspiring to wonder new story. Mobile will perfect for new born baby nursery. Low light bring magic. Painting absolutely save for health and glowing long time. Lyuba: Everyone! Talent create us successful but without work and dream we can reach our goals. If we didn't try - we can't know might or not. So just try, just do. This is my opinion and inspiration. No need begin new life from Monday or dream about perfect creation. Do it now. Do not fight, just enjoy. You can see more of Lyuba’s work in her Etsy store zmeyssHandMade. Back in January I snapped a photo of my collection of culled and wonky seed beads, in the hopes that it would take on some kind of transformation later. I knew of course that it would get bigger, but I wondered if the ratio of jet black to colorful beads would change much over time. It’s a little hard to tell just from a photo, but the amount of beads has increased by at least 50%. The color hasn’t really changed all that much. I wonder if it isn’t just my preference for jet black, but the quality of that particular color? I didn’t use jet black in my seed bead brand comparison, so it’s hard to tell. Right now all of the projects that I have lined up require either a bunch of planning, or I’ll be taking step-by-step photos. This means I can only work on them when I’m at home during the day, but I need something to bead in the middle of the night. So I think it’s time to finally get started on using this big bag of wonky beads. I recently checked in with the Ugly Necklace Contest, and there aren’t any rules posted for a 2016 contest. I hope this doesn’t mean there isn’t going to be one! I still find making an ugly design really therapeutic, so I’m going ahead with my idea. It’ll give me something meditative to work on, and I’ll get a chance to use up some of the colored bead threads I’ve had in my stash for forever, since I’m sort of hoarding the last of my Fireline right now. I’m not going to give too many details about my theme for the new piece, but I will say that it was inspired by a mean critique, and it will almost certainly include some UfOs. I’ll be sure to share some in progress photos! How do you store and use your culled beads? 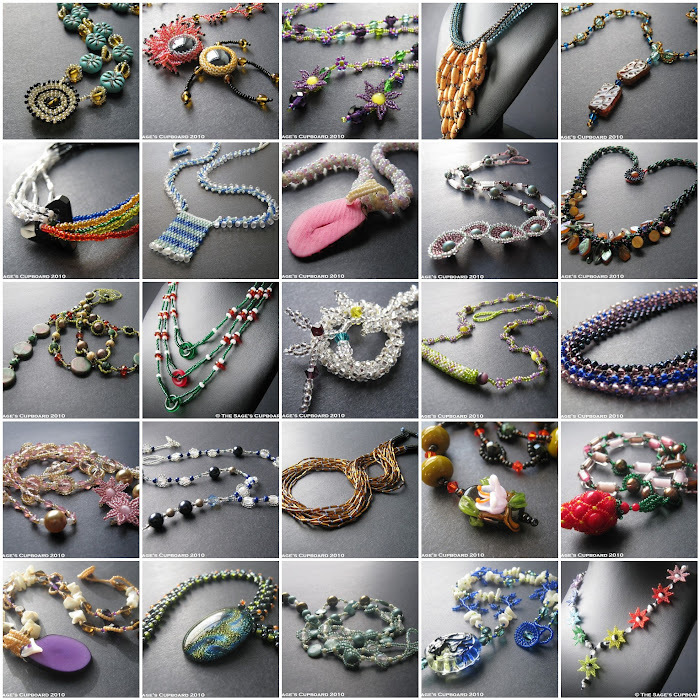 Five years ago this month I was beading non-stop for my Necklace a Day challenge, attempting to create and post 30 necklaces in 30 days. Although it was exhausting, I loved doing that challenge. I learned a lot about the materials and techniques that I was using, and discovered a lot of new designs thanks to the pressure of coming up with quick projects. 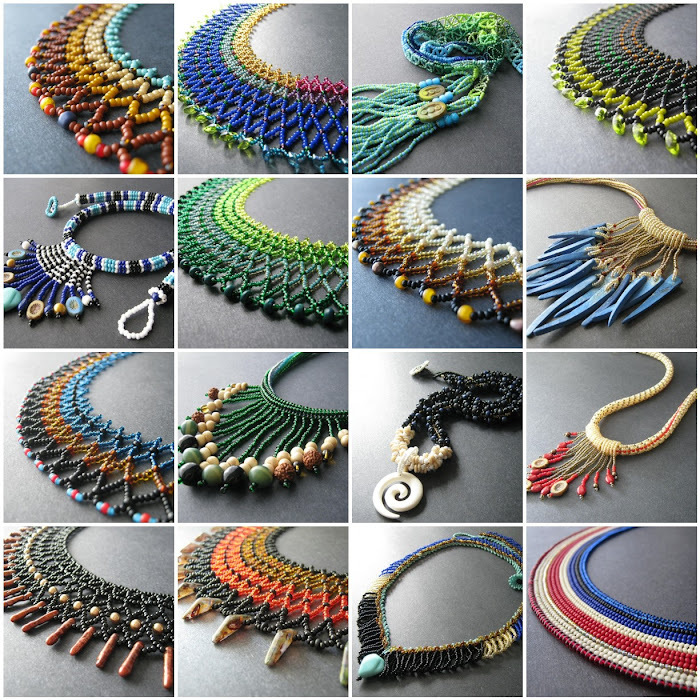 Some of my favorite designs were created during a Necklace a Day, including the first herringbone fringe necklace and some very tasty lariats. It’s always interesting to look back on collective projects like these and see how much my style has changed, and wonder if these old techniques could ever be made new again. I’ll probably never do a daily challenge again, but since then I’ve developed a lot of affection for creative challenges. It’s such a fantastic way to keep new ideas coming, not to mention creating opportunities to fail and learn from it. The successes can be pretty inspiring, too! My most recent design challenge was a more casual approach. The Egyptian Gods series had no deadlines, just the hope of eventually making a design for each of the most well-known Ancient Egyptian deities. I ended up cutting it short with only two projects to go in order to get started on Ancient Worlds Modern Beads, and once that was complete the challenge had lost its inspirational appeal. Really embracing the Egyptian themes that I love was incredibly inspiring and gave me the opportunity to create pieces that I really liked. It feels like a good time to start that kind of challenge again. This time, I want to explore my geek side – something that I haven’t shared here much before. The Geekspiration challenge isn’t one I can put a number on – there are just too many possibilities - so I’m going to put a one year deadline on it. We’ll check in and see how many designs I can come up with by November 2016. Right now most of my ideas are revolving around geek heroines, and designs inspired by their style. There might also be some more obvious inspirations that come along, too. I'm not saying I will definitely do a Minecraft pattern tutorial, but I'm not saying I definitely won't, either. Can’t wait to see what the beads will do!